This Miami Bass influence led us into today’s Baile Funk. After DJ Marlboro’s album and hit, many other DJs around the Rio de Janeiro area began wanting to imitate his success. Miami Bass beats flooded Brazil and DJs became abundant each with their own raps to the American beats from Miami. In order to define their culture and separate themselves from the American influences, the DJs began to get creative. Instead of just rapping over American beats, they would add influences from their own culture such as “candomble drum patterns and samba rhythms” (Gray, Baile Funk’s Electro 80′s). This is what started Baile Funk or Funk Carioca. By adding rhythms from their Latin culture, the DJs from Brazil were able to separate themselves from their Miami Bass influences. This became a new genre of music. The growth of Baile Funk was slow and had many influences. This genre grew thanks to the fusion of different cultures over time. The funk influences added the hip hop rapping that is displayed in Baile Funk. The Brazilian culture added the samba sounds and Latin feel to an otherwise American electronic genre. Without the history and influences that Baile funk gained over the decades, this genre would not exist today. Frederic P. Miller, Agnes F. Vandome, John McBrewster. Miami Bass. Miami: Alphascript Publishing, 2010. Gray, Doug. "A Short History of Baile Funk." 15 December 2009. The Rio Times. 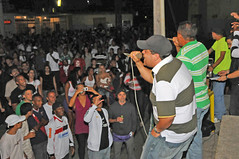 17 April 2011 <http://riotimesonline.com/brazil-news/rio-entertainment/a-short-history-of-baile-funk/>. Gray, Doug. "Baile Funk’s Electro 80′s." 22 December 2009. The Rio Times. 17 April 2011 <http://riotimesonline.com/brazil-news/rio-entertainment/baile-funks-electro-80s/>. Marlboro, DJ. Funk Brasil. Rio de Janeiro, 1989. Album.